According to a recent study, 72.6% of salespeople using social media actually outperformed their colleagues who were not on social networking sites. As marketers, we know that social networking can provide value to the sales process. But how do we actually get sales buy-in? 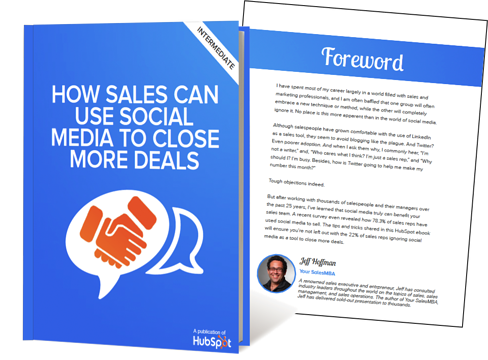 This free ebook will dive into how your sales team can use social media sites to close more deals, with an exclusive foreword from Sales Expert and Consultant Jeff Hoffman. Fill out the form to your right to get your free copy of this ebook (and share it with your sales team! ).